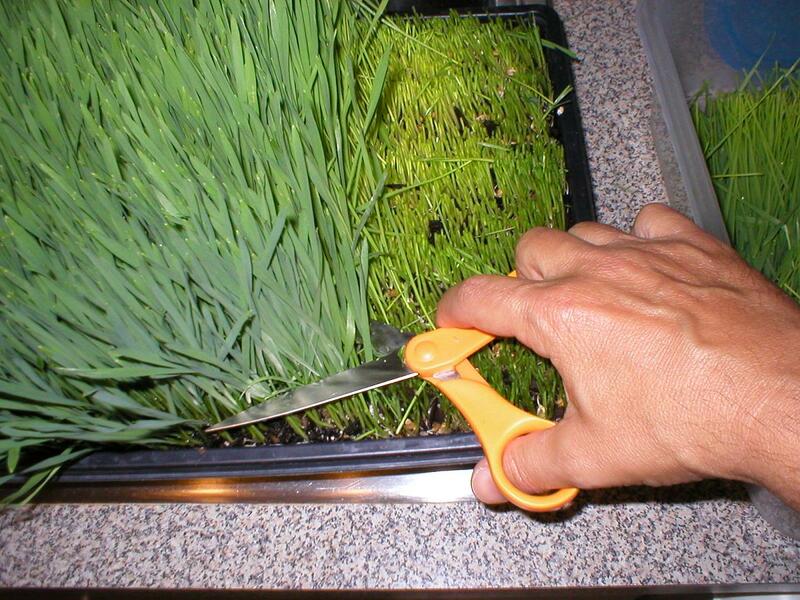 Cut mature wheatgrass just above (about one half to one inch) the soil surface. At some point in the growth cycle the wheatgrass is at an optimal nutritional juicing point. This optimal harvest point is just before the grass starts to split or bud (also known as joints or the pre-jointing stage) and begins it’s reproductive cycle. When whaetgrass prepares itself for it’s reproductive cycle it pulls a tremendous amount of nutrients from the soil and into its stems and leaves. This is why I recommend to harvest all the wheatgrass at this point and juice what you need to immediately consume and store the rest in a container in the frig. High humidity during the growth cycle may cause mold to grow at the base of your wheatgrass. 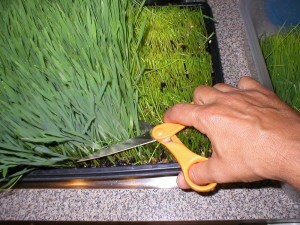 If mold does appear rinse your wheatgrass thoroughly before juicing or consuming raw wheatgrass. 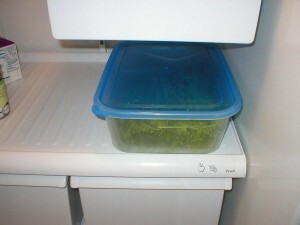 Harvested or cut wheatgrass placed in a container will last about seven or eight days in a common refrigerator. Do not let harvested wheatgrass freeze and do not eat or juice wheatgrass if it has begun or has turned yellow. Needless to say, just like almost all living harvested foods the longer you store them the more the food breaks down and changes. 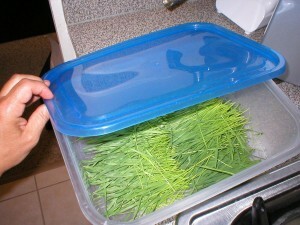 Put your freshly cut/harvested wheatgrass in a container for cold storage. Cover your wheatgrass container and put in your refrigerator in a place where it will not freeze. Wheatgrass is great because the growing cycle is only between seven and fourteen days. The difference in the time growing cycle is due to watering, sunlight and temperature differences. 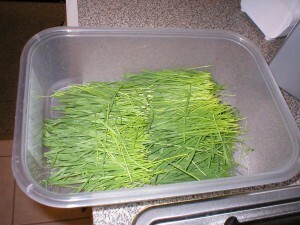 Wheatgrass can be grown and harvested only once. Please discard your post harvest growing remains properly. Proper disposal may include compost or mulch it into your outdoor garden. Organic wheatgrass growing remains have high natural organic make up and will add to the natural value of vegetable garden soil as well as many other types of gardens.